"He had a million ideas! And had a huge influence on the course of popular culture." 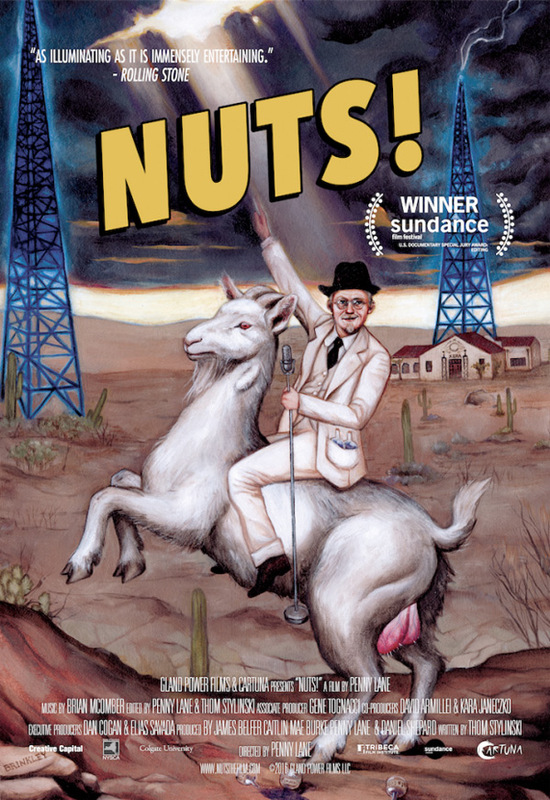 Amazon and Gland Power Films + Cartuna present the full official trailer for the documentary NUTS!, from filmmaker Penny Lane. This totally wacky, almost unbelievable true story documentary examines the life of a person named John R. Brinkley, one of the most impressive snake oil salesmen in US history, who made his fortune by surgically attaching goat testicles to men to cure impotence. It was all BS and this amazing doc turns it into an even more entertaining story by hand-animating half of it, as well as presenting bits of archival footage and interviews. Brinkley goes on to run a radio station and come up with all kinds of crazy ideas. Have at it. Inventive and wildly fun, NUTS! recounts the mostly-true story of John R. Brinkley, a Kansas doctor who in 1917 discovered that he could cure impotence by transplanting goat testicles into men. From there, the story only gets more bizarre. Mixing hand-drawn animated reenactments, interviews, archival footage, and a highly unreliable narrator, NUTS! traces Brinkley’s rise from poverty and obscurity to the heights of celebrity, wealth, and influence. Nuts! is a feature documentary directed by filmmaker Penny Lane (follow @lennypane), written by Thom Stylinski. It first premiered at the Sundance Film Festival this year, and received a Special Jury Award for Editing. Penny Lane's Nuts! opens in select theaters on June 22nd. Sometimes all you can do is step back and laugh. this guy had really giant balls to practice such surgery. And people who accepted should have had also a brain transplant.